Wedding Planner Mystery takes a vow on Hallmark Movies & Mysteries! Anyone messes with my wedding plans and they get a glue gun between the eyes! Everyone look out! Weddings are the new source of mysterious mysteries! And not lame themed wedding designed for Facebook likes, there is a murder and kidnapping in Hallmark Movies and Mysteries’ Wedding Planner Mystery! Luckily, no one ever can outwit a wedding planner, thus Carnegie Kincaid is on the case. Hey, is she named after Andrew Carnegie, who funded the Carnegie libraries, thus allowing this mystery book to have the obligatory references to libraries and librarians that just happen to be in 97% of mystery books I read? Obviously. Of course, I’d have to read Deborah Donnelly’s book to be certain, but I’m pretty confident in my guess. In fact, I hope the continued adaptation of mystery series means we’ll start getting all those series with talking animals and magical animals that help solve mysteries. I want a weekend that is all talking magic cats solving human murders and demanding more tuna! 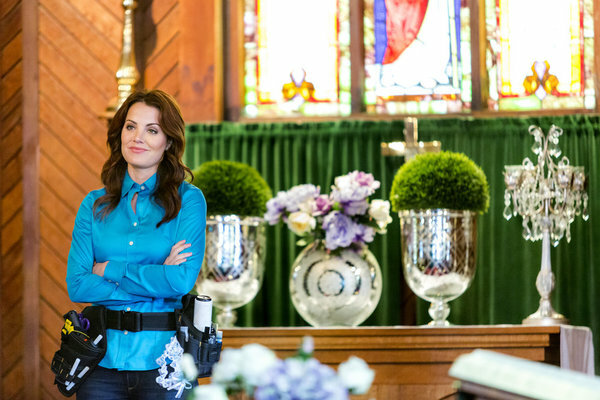 Based on Deborah Donnelly’s novel “Veiled Threats,” Carnegie Kincaid (Erica Durance) is a wedding planner and a perfectionist in both work and romance. When a murder occurs and a bride (Chelan Simmons) is kidnapped surrounding the wedding of a prominent family embroiled in a high profile fraud scandal, Carnegie becomes a suspect. She is questioned by police and pursued by shady news reporter Aaron Gold (Andrew W. Walker). To make matters more terrifying, Carnegie is pretty certain whoever is responsible for the crime is out to get rid of her. As she struggles to clear her name, Carnegie is hounded by a hard-boiled detective (Rick Ravanello) and wooed by a handsome lawyer (Brandon Beemer). With her life exploding into a whirlwind mix of danger, mystery, and romance, Carnegie begins to realize that love does not always arrive in a pretty package and that the perfect “Prince Charming” she’s been waiting for may not have her best interests in mind. Wedding Planner Mystery is directed by Ron Oliver (Perfect on Paper, Beethoven’s Treasure Tail), with a screenplay by Darcy Meyers (a writer for JAG and Silk Stalkings) based on the book by Deborah Donnelly. Wedding Planner Mystery premieres Sunday, October 19 on Hallmark Movies & Mysteries!